We were not impressed with this park. The ladies that run the place have so many rules that we were constantly trying to stay between their lines. Then, I get home and I have an extra charge on my card with no explanation. We will choose another RV park when we go to Gatlinburg. Restrooms very clean . very nice people Gatlinburg transportation stops in front of park. Will stay here again. Paved roads, paved sites, concrete patios, lots of space between sites, nice creek side sites, trolley bus stop at the end of the driveway, car rental, walking distance to grocery store, clean and well maintained. They care about their guests, and it shows. We had a wonderful stay at Twin Creeks RV Resort! The campground was clean as were the restrooms. The owners and staff were extremely nice and helpful! The spots are level and ours had a bench, picnic table and fire pit. It was so quiet and lovely there we slept with our windows open so we could hear the creek and all the night bugs. Can't wait to go back next year!! Stayed at Twin Creek for 3 weeks. 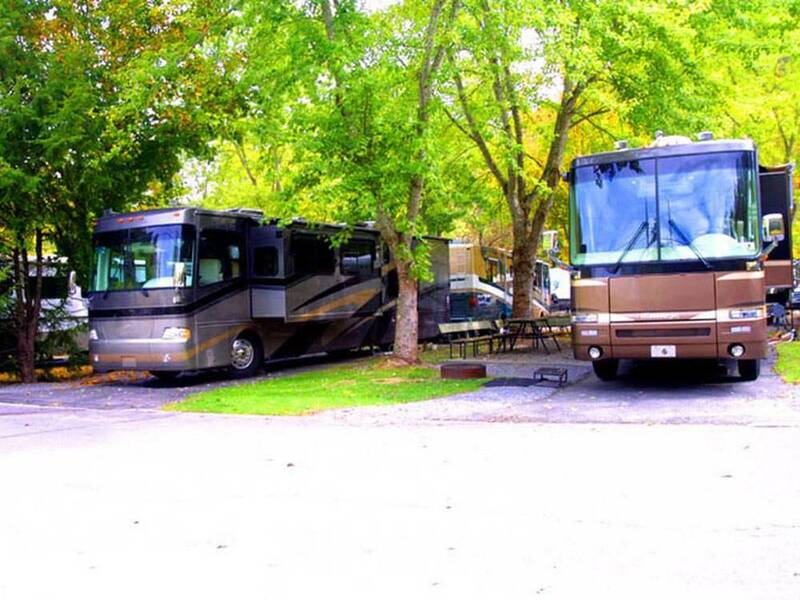 This is a great RV Park located just 2 miles from downtown Gatlinburg. There is a trolley stop just outside the campground (CG) that will get you around the area. Across the street is a very nice grocery store. The CG is beautiful and very well kept. Lots of shade trees. The staff is wonderful and very attentive. There reservation process is very old fashion and could use some automation. The picnic tables and benches could use updating. I loved the look, feel and location of this CG. Will definitely stay here again. Very quiet camp ground. The camp site was clean and large enough for our 34ft camper and full size supercab truck. It was close enough to the center of town but far enough to be peaceful and woodsy. The staff are very friendly and helpful. I was very disappointed when I call for reservations asked for a pull thru and I told them I had a motorhome 35ft.and a tow dolly pulling a mini van, they said fine that I could have one, well when we get here they tell us we have to take off the tow dolly and they would put it some where and when we were ready to leave they would bring it out for us, I told her we didn't want to do that because we are senior and that is why I asked for a pull thru, she said you should have told me that and I would have said we don't have any pull thru that you can leave a tow dolly on they have the first camper pull in and that is what they call a pull thru, and the next camper back in. Then she said that we could leave the tow dolly on if we wanted to pay for two sites, I told her we don't have that kind of money, so they charged us 10.00 a day extra for the other site, It was a different site then we were going to be getting, when we get there we pull thru the site was suppose to be for two campers, our front was just about on the road and with the dolly hooked up we could harley get our van behind the tow dolly, if that was not enough everything at the campground was so over priced, we washed two loads of cloths in there laundry and it costs us 13.50 just to wash and dry, while doing laundry my husband wanted a pack of cheese crackers and 1.50 a 6pk. come on now at most they are 1.00. They have signs everywhere don't do this and don't do that, you can't even move a rocking chair on the porch they have a sign. We were very disappointed .I would like to say something nice about the campground because I am not some one that just complains . The staff is very friendly. The campground is well cared for. The bathroom and showers are very clean and the showers are just like you would have at home. The laundry facilities are clean and in excellent condition. The fact they are close to everything, but away enough that it is not extremely congested is awesome. The campground is quiet and you do not hear the traffic close by. There is a large, full service grocery store and gas station just across the highway. Very convenient. This is not a complaint, but an observation - the office hours are very short. They close at 4:00pm, however I noticed that they staff/owners live on site. I'm sure if there would have been an emergency, they would have been able to assist. They accommodate late arrivals, however if you don't have a reservation you will be out of luck until they are open. I highly recommend this campground. Facility is very well maintained. As others have said the restrooms are very clean and the rest of the grounds are very clean. We stayed for 7 days and had a good time. The rate was $61 a night and we had a creek side site. Our site was quiet, but sites on the other side of the pool have more traffic noise. The only negative is the reservation process. Needed to leave a message and there was only a small postcard sent. Would like to have known the site ahead of time or have had the option to choose a site when booking. Would stay here again and recommend Twin Creek to others. These are excellent sites located within a 10 minute drive of Smokey Mt Natl Park. A bit pricy at $61 a night but you get what you pay for in Gatlinburg. Nice laundry and the showers were just like home. Very professional and friendly greeting and check-in. Great set-up at site with picnic tables and benches to sit on. Trolley picked up at site to get you to downtown Gatlinburg. Great place to be to reach the Smokey Mountain National Forrest and hike the Appalachian Trail. Loved the rockers on the front porch. Nice facilities! Great place to stay. The bathrooms were extremely clean. The office closed at 4pm which can be inconvenient. They will give a free night stay if you buy a certain amount from their woman's boutique. It depends on the amount per night they charge ours was $55 we needed to spend. However, there wasn't much that was less than $60. I guess you do get something for the stay. We were there at the end of their season. The pools and outside actiki ties were closing g for winter. The shower and bathrooms are first class. Very close to downtown but secluded enough to be out of the traffic noise. The folks who run the business could not have been more accommodating. I highly recommend staying there if you are planning a trip to that area and the Smoky National Park. Paved and level campsites with tables and fire ring.